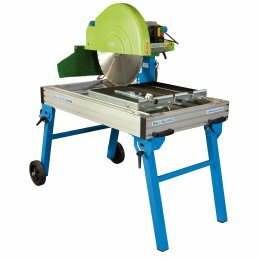 Bench / Brick Sawfor Blades up to 20"/500mm. Motor:Single phase 220V-230V.Max cutting depth:8"/200mm with blade 20"/500mm. Bench / Brick Saw Bali MKNO is designed for working with different cutting lengths and depths with ease, the cutting head is totally detachable throughout the Mekano range. The blade guard can be adjusted to make the maximum cutting height, 200 mm in a single pass. This allows cutting precast concrete and porotherm blocks. Heavy duty belt driven Masonry Saw for all materials. For cutting standard materials: Bricks Tiles Terrazzo Granite and special materials: Prefabricated concrete blocks - Porotherm blocks - Ytong blocks - Large bricks - Oversized stoneware. Bench / Brick Saw Bali MK for Blades up to 20"/500mm. Motor: Single phase 220V.Max cutting depth:8"/200mm with blade 20"/500mm. Poly-V belt transmission improves grip and reduces maintenance (BALI 500 MK). Folding guard, ensuring the maximum cutting height. Height adjustable arm allows Build with Inox materials. 3 blade sizes (BALI 500 Mekano). Ø500 mm blade included in BALI 500 Mekano. Set of 2 handles for an easy handling (standard).